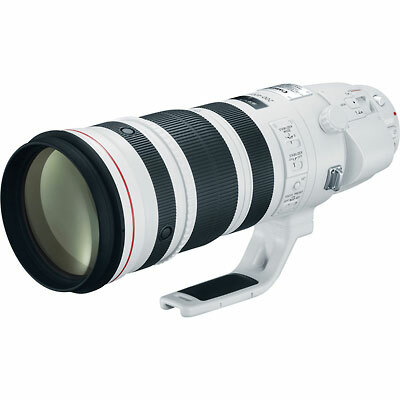 The EF 200-400mm f/4L IS USM Lens with Internal 1.4x Extender from Canon is a high-performance super-telephoto zoom lens with a built-in 1.4x extender that converts the focal range and maximum aperture to 280-560mm f/5.6. The extender is located at the base of the lens and applied with a simple lever switch. An Image Stabilization system offers up to four shutter speed stops of compensation against camera movement, which is ideal in low-light situations and when shooting at its long focal lengths. Three IS modes are available, each optimized for your specific subject. There is a mode ideal for static subjects, one for panning with moving subjects and an Exposure Only mode that applies stabilization only during exposure, offering you the speed you need to follow fast, erratically moving subjects. The EF 200-400mm f/4L IS USM Extender 1.4x features a flexible 200-400mm focal range with a fixed f/4 aperture, 4-stop optical Image Stabiliser and for the first time in a commercially available lens, a built-in 1.4x extender. These features combine to provide an outstandingly versatile lens for professional sports or wildlife photographers. A robust magnesium alloy design, environmental protection and specialised lens coatings also make it ideal for mobile use, combining with the finest quality optics to deliver exceptional results, even in the harshest conditions. The reach of the EF 200-400mm f/4L IS USM Extender 1.4x is boosted by its internal 1.4x extender, which is engaged or disengaged at the flick of a lever to provide an extended focal length of 280mm to 560mm - allowing photographers to get even closer to distant action. Ensuring the highest image performance, the optical design includes both fluorite and Ultra-low Dispersion (UD) lens elements, which help minimise chromatic aberration and eliminate colour blurring. Advanced anti-reflection SubWavelength Structure Coating (SWC) and Super Spectra Coating also reduce ghosting and flare. Thanks to the use of the latest optical technologies, image performance is unaffected when the integrated extender is used. With a fixed f/4 aperture (f/5.6 aperture when the internal 1.4x extender is activated) the use of high shutter speeds to capture fast-paced action or a low-light scene is possible. A newly designed optical Image Stabiliser, which provides users with a four stop advantage, while IS ‘Mode 3’ applies image stabilisation only at the time of exposure - ensuring that photographers can pan with fast-paced action without IS overcompensating for movement. This feature is ideal for sports photographers, who typically have only a split-second to capture a subject in front of them.